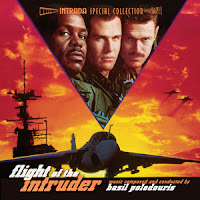 World premiere release of Basil Poledouris score for John Milius actioner set during Vietnam war, starring Danny Glover, Willem Dafoe, Brad Johnson. Poledouris excelled when working for close friend Milius. Current score is prime example! Muscular action and melody combine. Neat architecture: Score opens with reflection, progresses with melody, degree of power. Action rears, intensity of music increases. Finally, symphonic march takes center stage, brings everything to rousing finish. Intrada presents entire score from original Dolby SR-encoded two-track stereo session mixes, courtesy Paramount Pictures. Two alternates appear as extras. 5/5 I don't even have to tell you, you should be getting this for your collection... right now!